Our commitment - your success. The Gough Group draws on a rich heritage stretching back over 80 years. We are NZ's leading value-added solutions provider to the infrastructure, mining, forestry, transport & power system industries. The Group is made up of three distinct parts; the Equipment Group, the Transport Group & Gough Finance & Corporate Services Group. We are proud to represent in New Zealand such premium global brands as: Caterpillar, Hyster, SAF & Palfinger. Together we've built a reputation for quality and integrity! With highly-skilled employees & a network of over 50 locations in Australia & New Zealand, the Gough Group remains an integral & high-value partner within the industries we serve. Please visit our website for more information or contact us to discuss your requirements today. 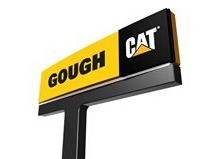 or over 80 years, Goughs has been the Caterpillar dealer in New Zealand, supporting a wide cross section of leading industries across many markets, giving us a proven history of commitment to our customers. Goughs has a national network of 18 branches from Whangarei to Invercargill, and employs 425 dealer staff.